(A) GR immunohistochemistry in lung and liver at ZT8 (Day) and ZT20 (Night). GR expression is shown in brown; nuclei are blue. Br, bronchioles. C57BL/6 mice were given vehicle or 1 mg/kg i.p. dex at ZT6 (1 pm, day) or ZT18 (1 am, night) and culled 2 hours later, and lung and liver were analyzed by RNA-Seq. (B) Venn diagram depicting all GC-regulated genes identified byDESeq2 (n = 2 per group, >2-fold change to vehicle control, <0.05 FDR). 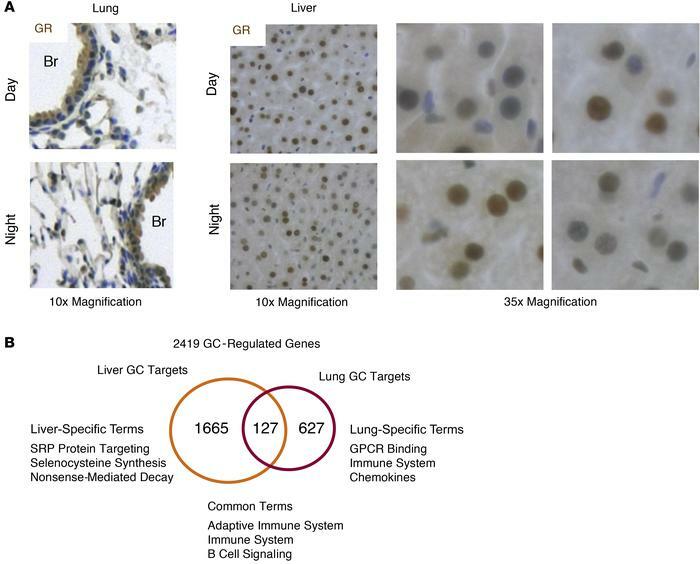 Lung- and liver-specific targets are indicated, with gene ontology terms for each group listed below. SRP, signal recognition particle.